Highway rest areas have their preservationists too. Waltzing across Texas on our highways is a way of life around here, but with the 4th of July Holiday upon us, many more are set to be on the road the next few days. That's probably why the Wall Street Journal published a story today about the trend among states to close so many of their highway rest areas in a budget-trimming move. The rationale is that so many private fuel stops and restaurants have cropped up that the humble rest area is no longer needed. To the surprise of many, this has not been well received. Truckers associations and the AAA, among others, have begun touting such steps as a threat to highway safety. The gem of this article to me was to find the web site, Rest Area History.Org, which is dedicated to documenting the history of highway rest areas and preserving them. As I read the article, I found it strangely inconsistent with what I had experienced lately. It seemed to me that rest areas in Texas were enjoying a resurgence, with large new facilities having recently opened near Belton and Sweetwater. Sure enough, later in the article, Texas is noted as a state bucking the trend, going as far as adding wi-fi hot spots to most of the state's rest areas. TxDOT maintains this interactive map showing locations of the state's rest areas, including a photo gallery of many. If you're out and about, check out the big new ones in Bell County and Nolan County. 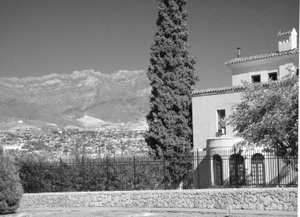 I'm sorry to say that I had only been to El Paso once in the past, and then just to attend a conference. It was not a great opportunity to get to know the town. This time, however, I had the chance to explore a bit and did so without the help of travel guides or advice from friends or natives. 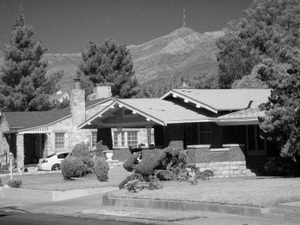 I was very excited to find quite an attractive city, from a downtown with many restored and waiting-to-be restored buildings, to the striking architecture of UTEP, and especially to the neighborhood I just happened across. Much like my discovery in Toyah the previous day, I was driving a little west of the airport, when a magnificent Romanesque church tower up on a hill caught my eye. It turns out that the tower belonged to an absolutely pristine Catholic Church and school complex, Lorretto Academy. In addition was the adjacent Austin Terrace Historic District and a wonderful neighborhood of great homes, pictured at left, many of which have commanding views of the City below. Wow. I plan on returning with a little more planning and research. As I waltzed across Texas a couple of days ago, the image of this building from the distance caused me to whip off at the next exit and check it out. In the wide open spaces of far, far west Texas, this abandoned, red and tan brick high school rose almost magically out of the surrounding brush and stucco buildings. 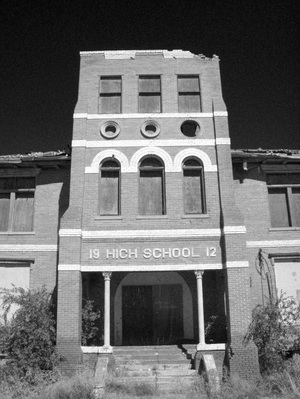 It's the 1912 high school for Toyah, Texas. As noted in this article in the Handbook of Texas, both the school and Toyah have seen better times.